Zack is good at making pancakes. I’m not. He can make them round and perfect – just like restaurant pancakes. Mine? Not so much. 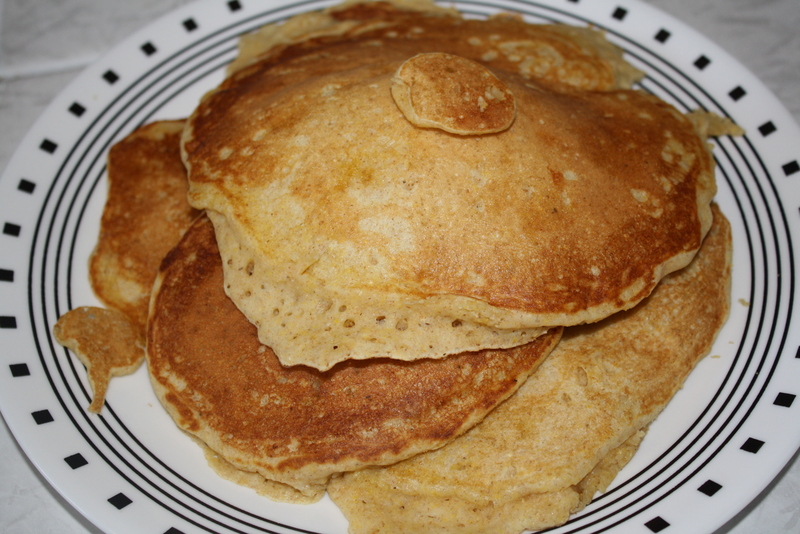 I splatter the batter everywhere causing all of my pancakes to have tails where the batter spread too much. Regardless, I decided to make him some multigrain pancakes. Although they were not the prettiest pancakes, he really liked them. I like the fact that they have whole wheat flour in them. I am a whole wheat addict. I like to incorporate it into as many different meals as possible as is evident throughout my posts. 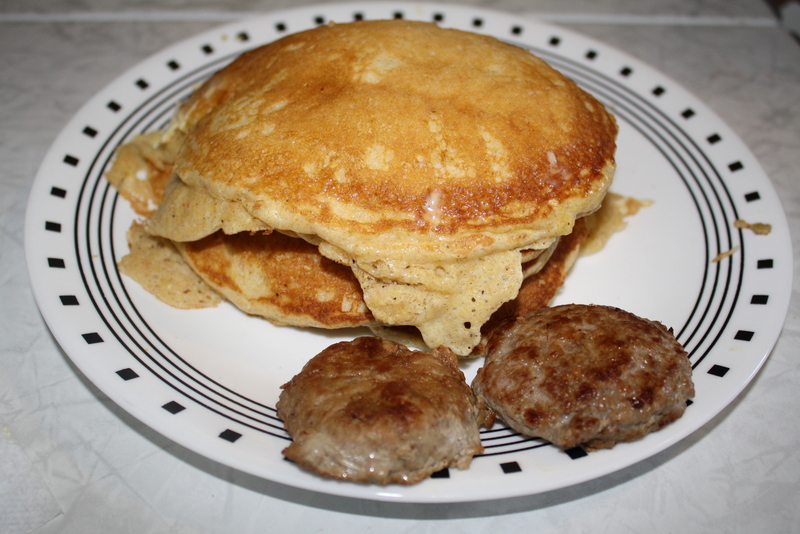 While I was severely struggling to make reasonably shaped pancakes, Zack made himself some turkey sausage. I’m a cereal-for-breakfast-every-morning type girl, but I have to admit that this combination smelled really good. Believe me – they taste much better than they look. In a large bowl, combine the first 6 ingredients. In a small bowl, whisk the egg, buttermilk, and butter. Stir into dry ingredients, just until moistened. 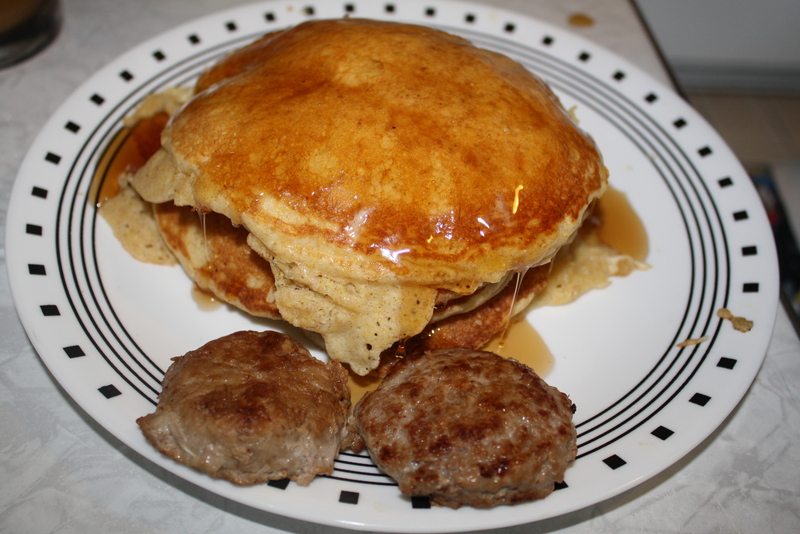 Pour batter by 1/4 cupfuls onto a hot greased griddle; turn when bubbles form on top. Cook until the second side is golden brown. Serve with syrup. who doesn’t love pancakes? if you don’t i think their are problems. Agreed! And thanks, they are just special pancakes haha! Great Harvest Bread Company has a multi-grain pancake mix that I love. I will have to give these a try instead. Sounds like a great recipe. I’ve never tried that mix, but this recipe is really good! Thanks! I want a stack right now, too. Haha, thanks!